"This is Daisy, our lovely little pup at 8 months old. She is a Cavalier King Charles Spaniel crossed with a Miniature Schnauzer. I'm amazed there aren't more of these mixes around; she has an absolutely lovely nature. She is very friendly and affectionate and always loves to snuggle up by or on you. She loves people, all other dogs and even cats—especially our cat Alfie. Alfie has even grown to love her, too. She loves the park and her very favourite thing in the world is chasing a ball." The Mini King Schnauzer is not a purebred dog. It is a cross between the Cavalier King Charles Spaniel and the Miniature Schnauzer. The best way to determine the temperament of a mixed breed is to look up all breeds in the cross and know you can get any combination of any of the characteristics found in either breed. Not all of these designer hybrid dogs being bred are 50% purebred to 50% purebred. It is very common for breeders to breed multi-generation crosses. "Riley is a 7-month-old King Schnauzer, a mix between a Miniature Schnauzer and a King Charles Cavalier. She is about the size of a Miniature Schnauzer. She is extremely smart. She was potty-trained within days of bringing her home at 8 weeks old, and she knows a ton of tricks. At three months old she learned to sit, lie down, shake, roll over, “bang” (play dead), spin around, jump up, hush, speak, leave it, drop it, come here, down and also knows all of the names of her toys. She loves to snuggle with people and is a wonderful listener. She cannot get enough of little kids; she loves giving them kisses and playing chase with them. She also gets along wonderfully with other dogs, however other dogs sometimes aren't a fan of her high energy. I take her to a dog park every day to wear her out a bit and she loves to play and run with the other dogs. Her favorite game is fetch, and she brings the ball right back. She prefers playing and running around with larger breeds; the smaller breeds don’t seem to entertain her as much. She will get into chewing trouble, but she stops immediately on command. She is extremely curious, intelligent and lovable." 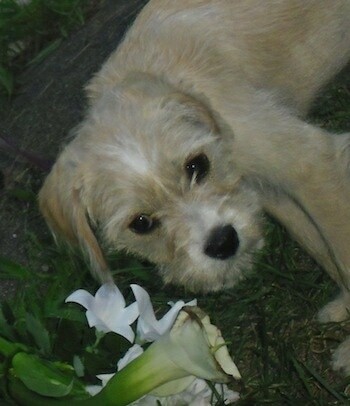 "Sandi the King Schnauzer at nearly 5 months old—she is a Mini Schnauzer and Cavalier King Charles mix. I am very surprised at how great of a dog she is. She is very intelligent and has a personality that's just too hard to ignore. She likes to be around people. At times, she will cuddle up on a lap or just plop down next to someone to take a nap. She follows me around the house when I am doing chores and always has a curious mind—she will sniff and inspect everything I touch or do! She is a quiet dog and hardly barks, however, she can be over-protective of her owners when outside. She loves to play fetch and enjoys actively interacting with people."